An acquaintance called me out, suggesting that I should not have mentioned The Adventures of Tom Sawyer, with its liberal use of the N word and its awful attitude towards Native Americans. 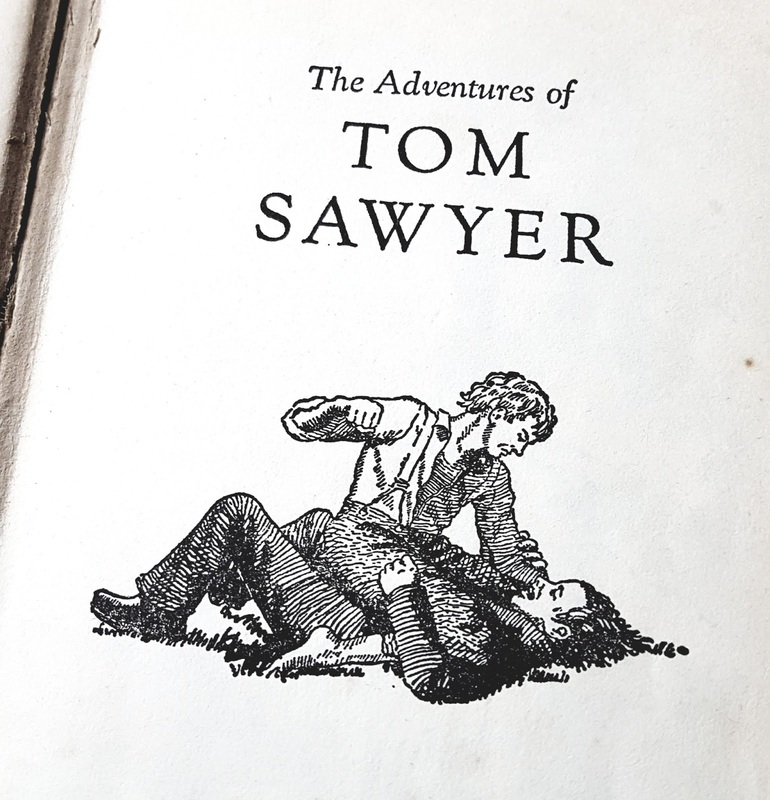 Tom Sawyer occupied 'favourite book' status for a long time in my childhood. It was one of the first novels I read, alongside Heidi, Little Women, and other books from that bygone era. In the decade I've been an author, I have often mentioned it as one of the books that made me write. And I had not given any thought to how its 1875 attitudes might impact contemporary young readers. Frontispiece of my childhood copy. The illustrator of the beautiful pen and ink pictures throughout is not credited. My acquaintance was right. I had been uncritical in including Tom Sawyer. 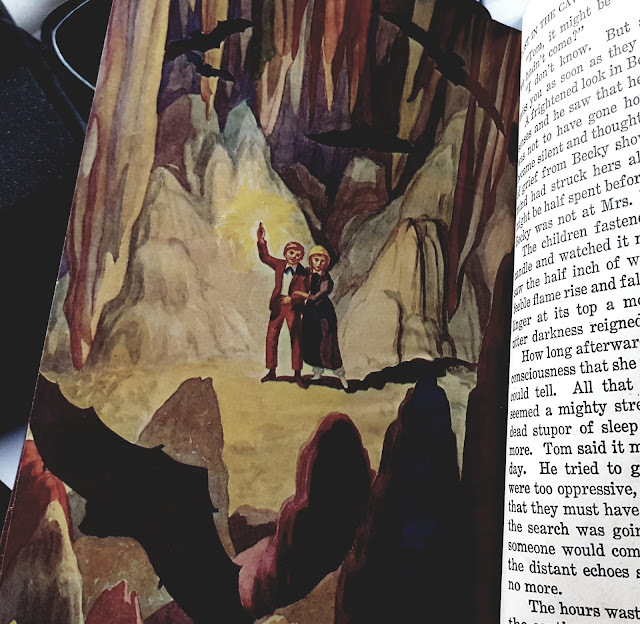 The focus of that piece had been the idea that books can transport a reader to other places, other worlds. I may have honestly been listing the books that had done this for me as a child in Manila – but as a children's author, book advocacy is a huge responsibility. It was uncomfortable to be called out, and I spent hours soul searching and reading, trying to understand what was wrong with mentioning this book that had been beloved to me for so long ... and how I could do better. As a young reader, I had adored Mark Twain's droll voice; the helpless warmth of characters like Aunt Polly, Tom's foster parent, Tom's irreverence towards church and school (so exciting for a child in a conservative Catholic community); the scary scenes with Injun Joe; the temptations of Huckleberry Finn's outlaw life the boys running away then attending their own funeral; and that final adventure, with Tom and Becky lost in a cave. I did not question the portrayal of Tom Sawyer's community where black characters were ever present but excluded from the unfolding adventure. Nor did I worry about the negative portrayal of Native Americans. I saw the same on TV and in the movies. Indeed, the setting was not dissimilar to Manila of the period, where light-skinned mestizos were regarded as superior to darker complexioned morenos. There was also a big social divide. Families of middle class professionals were meant to stay away from the bakya crowd – bakya being the cheap wooden clogs worn by the poor. Seeing white people look down on brown people on our screens and in our books no doubt contributes to our (Filipino) self-consciousness about flat noses and dark skin (skin whitening is big business in the Philippines) – a self consciousness that borders on self hatred. A scene in which Tom and his friends play Indian. I was shocked and fascinated by the nakedness! So as a child reader of my time, I accepted the N word, the demonising of Native Americans, and the exclusion of black characters, as a given. It was as normal as the fact that I had never met a Filipino character in the books I loved. That was just what books were like. I have the actual crumbly, yellowing copy that I had read as a child, part of a collection of children's classics my father bought from a door to door salesman in the 1960s. About ten years ago, I rescued it from my mother's termite-infested book case in Manila, lugging the whole set of classics back to London in my cabin baggage, along with the rest of the collection. It had been 30 years since I had read a line from the book, but as soon as I began I was transported back to my childhood when I lay sprawled in my bed, with the electric fan turned on high, laughing and wishing I could be Tom Sawyer. But reading it now, as an adult who has experienced racism and intolerance, as someone whose world had expanded beyond Manila, I cringe at lines I had read without question as a child, especially the ones in which Injun Joe's vileness is attributed to his race. 'The Injun blood ain't in me for nothing,' Injun Joe says to justify his misdeeds. Reading it again, there's no denying Twain's antipathy towards Native Americans. 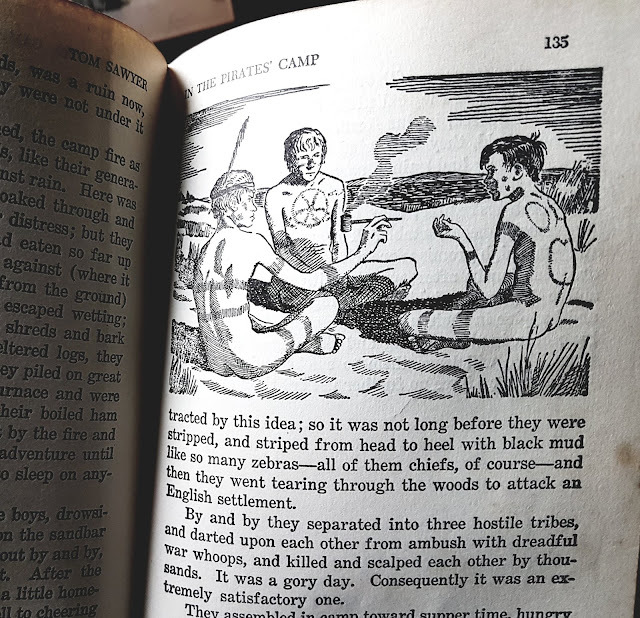 Twain's baddy is the conniving, betraying and murderous Injun Joe; Indians are referred to as vicious, devilish, savage; and Tom and his cohorts war whoop, pretend scalp each other then smoke peace pipes. Do read this thorough review by Debbie Reese. Rereading Tom Sawyer also sparked a long ago memory: of wishing that girls too could have adventures like Tom Sawyer. Girls didn't get to participate in all the antics and fun enjoyed by Tom and his pals. They were portrayed as pretty creatures, gullible (like Aunt Polly) to Tom's clever manipulations. When Tom is lost with his crush Becky in the caves, Becky is described as "frail" and cries so much that Tom's "encouragements were grown threadbare with use and sounded like sarcasms". The cave scene. A few coloured plates intersperse the pages, and inexplicably they are credited (to illustrator Edward F. Cortese) though the black and white illustrations have no credit. In a PBS video, author Grace Lin (Where the Mountain Meets the Moon) says: "Do you have an old children's book you love? One of those classic books you read with your kids because your parents read it with you? Well. There's a good chance it might be racist." But how does that work? Wasn't Mark Twain simply representing the reality of 1800s? Wasn't that what made the book special in the first place? Does that mean all these classic books should be discarded because their old fashioned prejudices would not pass muster against our contemporary sensibilities? Sometimes, good people, people you love, aren't always right. And that is how I feel about these classic books. I'm not saying we should ban them. I'm saying we should treat them like out-of-touch relatives. We all have that aunt or uncle, or maybe even a parent, who believes in things you don't agree with. You can still love that relative, and you can still let them be a part of your child's life. But because you know they might say something you don't like, don't you try to keep an extra ear open, in case they say something in front of your child? And then, don't you explain afterwards? That's what I'm saying about these classic children's books. Read them, share them, even love them, but make sure you talk to your kids about them, too. I love Tom Sawyer because I can still remember how it took me away from my boring, mundane life in Manila. I love Tom Sawyer because of Mark Twain's crackling storytelling voice. I love Tom Sawyer because it so vividly captures life in Missouri in another century. I love the realism of Twain's style but I do not love the reality he was representing. 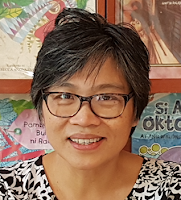 Yes, I believe that Tom Sawyer should be read by young people today – but I agree with Grace Lin, it cannot be read without context because it has the power to do harm. I recently finished writing a children's biography of the explorer Ferdinand Magellan, who is credited with leading the first expedition to circumnavigate the world. The other thing he did though was participate in Portugal's conquest of the Indian Ocean. Reading other biographies for children, the conquest is always skimmed over, and presented as a kind of glorious training ground for Magellan's future achievements (one of which was to "discover" the Philippines). But there was nothing glorious about the pillaging and genocide the Europeans committed in 16th century Africa and India. I couldn't help wondering how an African or an Indian child would feel reading my story ... and found myself writing with extra care for those future readers. Mark Twain is quoted as saying that he didn't write The Adventures of Tom Sawyer for children. Well, he didn't write it for black and Native American readers either. I have seen that we do not intend to free, but to subjugate the people of the Philippines. We have gone there to conquer, not to redeem ... It should, it seems to me, be our pleasure and duty to make those people free, and let them deal with their own domestic questions in their own way. And so I am an anti-imperialist. I am opposed to having the eagle put its talons on any other land. And yet I discover now that he while he could expound on the plight of faraway Filipinos, he didn't feel the same about the plight of Native Americans. "He could denounce imperialism abroad while mostly ignoring it at home," writes Kerry Driscoll in Mark Twain among the Indians and Other Indigenous Peoples. Knowing this, it's hard to imagine myself trading witticisms with Samuel Clemens across a dining table. Reflecting on Tom Sawyer today, and how reading hundreds of books in my childhood I accepted that the absence of people like me and the prejudice against African Americans and Native Americans was just "how books are" ... it is inspiring to know that bookish folk are pushing back with hashtags like #WeNeedDiverseBooks, #ReadtheOnePercent, #Representation Matters, and #ReflectingRealities. Books – beloved or not – have been part of our systemic inequalities for so long, and it feels like change may be coming at last. But at the same time, isn't it tragic that 144 years after the publication of Tom Sawyer we are still struggling? When I think back, ALL the books I read as a child were dangerous. They took me out of the ordered rules of my cultural life and proposed that there were other choices out there. Yes. Books really are powerful. And that is why, in future, I will not mention The Adventures of Tom Sawyer without giving it its proper context. I am currently the Writer in Residence at Booktrust. Do visit and see my latest post, about some empathy epiphanies I had during my busy, busy March of book tours!